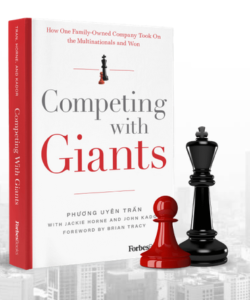 In 2012, Vietnamese business executive Phuong Uyen Tran and her family walked away from a $2.5 billion offer. That offer – to buy a majority stake in their business – came from one of the world’s biggest multi-nationals, Coca Cola. Had the deal gone through, it would have represented the biggest foreign acquisition of a domestic private sector company in Vietnam’s history. However, the family declined the offer, turned their backs on a humongous cheque, and continued to build their business – a beverage company that Dr Tran Qui Thanh and his wife, Pam Thi Nu, had founded in 1994, the year the US lifted its punishing trade embargo against Vietnam. Tan Hiep Phat (THP) is now Vietnam’s largest privately owned beverage company and a billion-plus dollar business. It expanded against a cripplingly difficult backdrop of trade sanctions and hyperinflation and today has annual sales of more than 1.5 billion bottles of herbal tea, green tea, water, soya milk and energy drinks. Rags to riches stories – if the family history is anything to go by – are not, it seems, always restricted to the world of fiction. Then Phuong’s father spotted an opportunity to grow his business by buying some beer production machinery owned by one of the country’s state-owned companies. It had been broken up for scrap but bit by bit her father, who had a mechanical engineering background, restored the equipment. “It took him two years to rebuild it, but he got it working at 80% capacity,” she recalls, adding that when things eased a few years later, her father began travelling abroad, investing in new machinery. Times were very hard, she says, recounting how on one occasion the family’s warehouse was destroyed by rain. Her parents persevered and the beer, initially sold to local cafes and restaurants became increasingly popular throughout Vietnam. Around the turn of the century, Dr Thanh began focusing on the manufacture of soft drinks and a successful range of drinks followed; an energy drink, a green tea and a herbal tea. “Today we produce more than one billion litres of drinks annually,” says Phuong who joined the company in 2003 at the age of 22 as secretary to the Marketing Director, after studying for a degree in business management in Singapore. All of the company’s processing lines deploy “aseptic” technology, which results in full sterilisation of THP’s made-on-site plastic bottles, eliminating the need for preservatives. It was the first company in Asia to invest in this kind of cutting edge technology. Her father, she recalls, wanted her to learn about the company from the bottom up. And she did – Phuong gradually worked her way up to her current role as Deputy CEO. She inherited her father’s workaholic habits, often putting in 16 hours a day on the job. And while her father appears intent on passing the reins of THP to his daughters eventually (her sister also works in the business), he has publicly acknowledged that: “Inheriting the business is not a benefit, it’s a responsibility”. 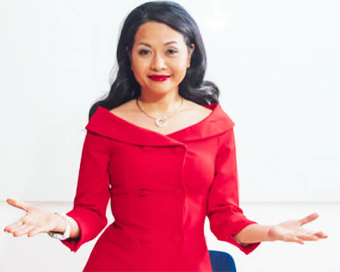 Phuong’s book not only details the family’s riveting journey to success, but provides graphic insights into the young businesswoman’s personal journey as a second generation, millennial female leader on a mission to be the voice of a New Vietnam. Phuong recognises that it can be challenging to be a female leader in a patriarchal country, and in the male-dominated higher corporate levels, but it is possible. In fact, the phrase ‘Nothing is Impossible’ is a key lesson for her and her family, she believes.